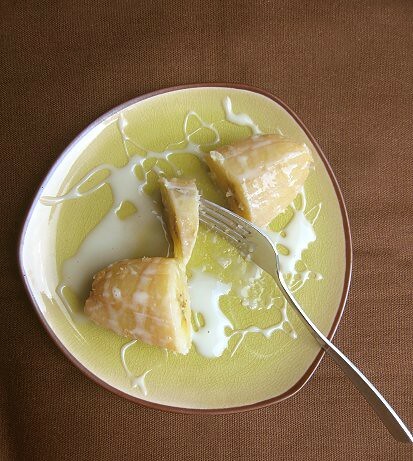 Some of you may remember the tragic failure of our previous boiled saba banana attempt. What? Boiled saba banana? "What is that? ", you ask. Saba is a type of banana or plantain in the Philippines that is commonly eaten as a snack or dessert. Sometimes it's fried with sugar, or wrapped up in a wrapper and fried (see Turon (Philippine Banana Spring Roll)), or, simply boiled. Boiling is something that tugs at our lazy heartstrings, so that's the way to go for us. Ah yes, the tragic failure. 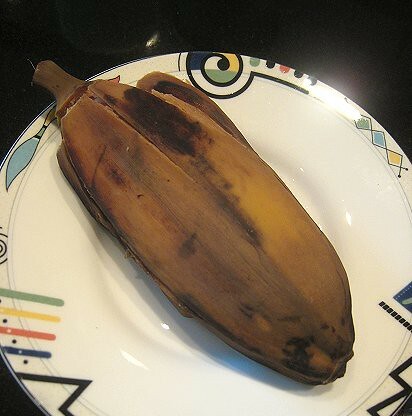 The previous time we attempted this, we bought burro bananas from the store, thinking that they could be saba. But, I think perhaps not. As you can see, they turned a funky red color! That was too weird. Also, the banana itself wasn't sweet at all! Very disappointing. This time, success was sure as someone had brought these saba all the way from the Philippines. What's more, someone else much more knowledgeable was also responsible for boiling them. Oh! You keep them in their skins while boiling! That's useful to know. They were simmered over low heat for several hours. I'm thinking that one can't really overcook them. Afterwards, they turn brown like so. One can serve them in a light syrup (brown sugar melted in water). In fact, that is what Minatamis na Saba is. But, making syrup means doing some work. So, I simply popped open a can of condensed milk. I love condensed milk anyway. Although, even to my condensed milk-loving self, the boiled saba were very good eaten as is without adornment. I guess this is actually just plain ol' nilagang saba (boiled saba), not minatamis. Now, all we need is another good Samaritan from the Philippines to bring us more saba! How very interesting! Now I have another new item on my shopping list when I go to Manila next month! this looks delicious, but also this reminds me of something we ate at school: bananas, lemon juice and powdered sugar..
We call that saba banana as pisang kepok. 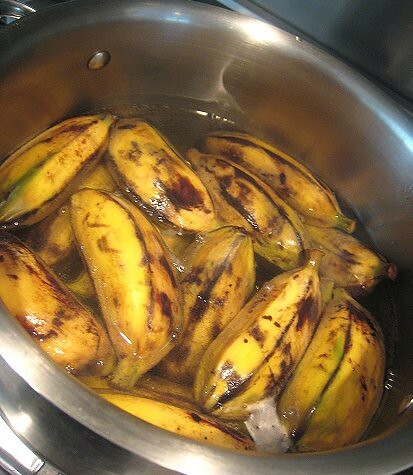 Love to use it for pisang aroma or lumpia pisang which you cal it turon. 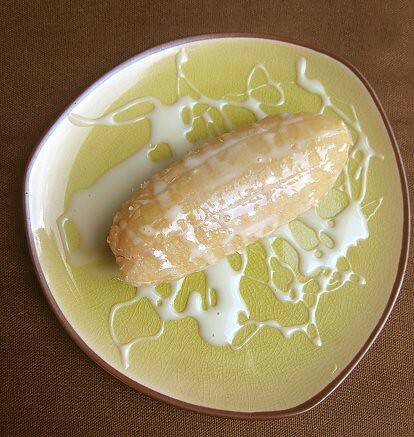 I actually made this banana for the Indonesian style banana iced dessert (Es Pallu Butung). It's enriched with rice flour porridge, pandan, coconut milk and red syrup. Btw, I like buying turon at the Filipino store in Winnipeg. Lazy to make my own pisang aroma. How fabulously exotic! This is completely new to me! Oooh, I hope to read about the trip on your blog! Oh, interesting. Were the bananas prepped in some way? Or were they just straight out of the peel? 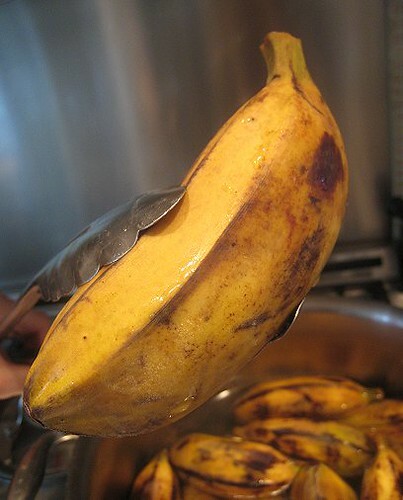 Did you unpeel the whole banana and sprinkled the lemon juice and powdered sugar on top, or did you eat the banana the "usual way", unpeeling as you go, but dipping each bite with the lemon juice/powdered sugar? Thanks for the comment. They do taste like banana, but not really. Actually frozen ones are for sale here. Here, they are available in our Chinese/Asian supermarket. Or, one can probably find them in Filipino stores. The frozen ones are already boiled, so after thawing, they're ready to eat.